The start of a new year is a time for reflection and renewal, an opportunity to consider the possibilities ahead while expressing gratitude for what has passed. It is also a time when I can’t help but consider how many of my current professional opportunities stem from my recognition as the 2012 Connecticut State Teacher of the Year and my involvement with NNSTOY. Whether I’m conducting research, writing, traveling or presenting to colleagues, much of what I have accomplished has been made possible by NNSTOY, and these experiences have enriched my life immeasurably. The doors opened for me by NNSTOY have highlighted and reinforced the value of teacher voice, teacher leadership and teacher empowerment. I am fortunate and grateful, and I know that I am not alone. At every turn, the most significant aspect of NNSTOY participation is the people we get to know. Anyone who has ever attended an NNSTOY event will come away not only impressed and inspired, but with an expanded network of brilliant, compassionate, and insightful educators and stakeholders. There is a robust, tangible sense of fellowship and respect among NNSTOY members and supporters, and it is truly an honor to work with and learn from such exceptional people. It is reassuring to know that I can reach out to anyone in this vast, diverse support system, and receive a positive dose of passion, wisdom, and encouragement. I am thankful to belong to such an organization. A new year gives us pause and allows us to be rejuvenated. There is joy and promise in the uniqueness of each day and in each person we meet. Being a part of NNSTOY and having the opportunity to interact, learn, share, laugh, and grow with so many amazing people is a blessing. Thank you. You are life-giving water. Thanks also to each of you who has made a donation during our Annual Giving Campaign. If you have benefited from NNSTOY in some way but have not yet made a contribution, please consider giving and being recognized as a FRIEND OF NNSTOY. You can go to https://secure.donationpay.org/nnstoy/ to make your donation. Your contribution is a validation of the meaningful work that we carry out, and will further NNSTOY’s mission to cultivate policies and practices that support excellent teaching and learning for all students. Together, we can continue to elevate our profession and positively impact our school communities. 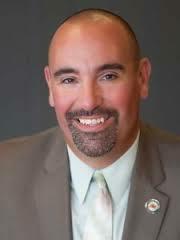 David Bosso is the 2012 Connecticut State Teacher of the Year and a member of NNSTOY. He teaches social studies at Berlin High School in Berlin, Connecticut.